And you all really outdid yourselves. If you haven't read through the whole comment thread, I encourage you to do so because I know I will miss some great entries as I pull out my personal favorites. Speaking of which, here they are! Jake: All hail the Hypno-Toad. 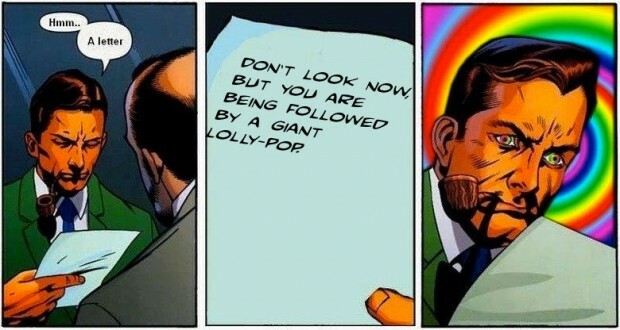 Hammerknight: Don’t look now, but you are being followed by a giant lolly-pop. DiCicatriz: I replaced your contact lens solution with LSD. Good luck. Keric: Dear Sir, Congratulations our tests show that you do an active X-gene! But one entry stood head and shoulders above the rest, right from the start. And that entry belongs to Hammerknight! That's just my personal favorite, though, let me know which ones tickled your funny bone the most in comments. I pretty much surmised that Hammerknight would get this one. I think that this is the first caption contest that I have won. I just looked at the picture and it screamed out at me. Best thing ever is that my wife just read it and busted out laughing. Thanks Jeff. My reaction exactly, HK! That’s pretty much how I judge these — did I laugh out loud? If the answer is yes, that’s probably my winner. Congrats, guys. This is a unique experience for me, as the LSD-contact line was the first ever drug-related comment that I’ve laughed at. (I’ve seen people ruin their lives too much.) Maybe it was the prosaic, ‘good luck?’ Btw, does anyone want to pm me with the names / initials I SHOULD have used?